TS Polycet 2018 application form will be accessible from the second week of March 2018. State Board of Technical Education and Training (SBTET), Hyderabad conducts this entrance test for admission to diploma programmes in government, aided, Private unaided polytechnics and Private unaided Engineering Colleges. Candidates seeking admission in engineering/non-engineering diploma courses can apply to this test. 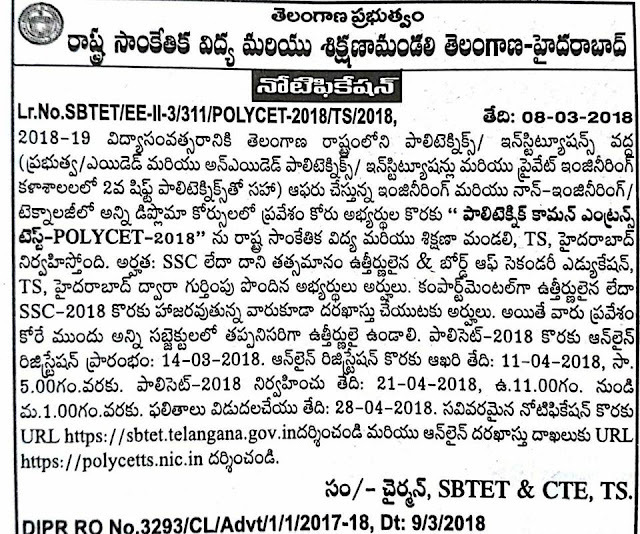 This article contains detailed information about TS Polycet Application Form 2018. 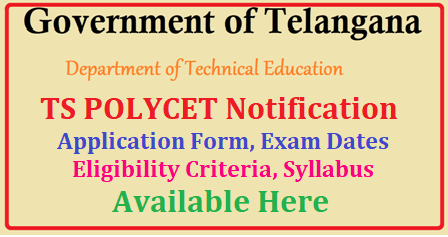 Here we will update the latest notification about TS Polycet Application Form 2018. Here, we will also provide the official link for filling the online application form of TS Polycet 2018. Aspirants can fill the TS Polycet 2018 application form in the second week of March 2018 (tentatively). The application form can be filled till the second week of April 2018. Students can fill the application form either by visiting the official website of exam conducting authority or candidates can also visit the nearest TS-Online or Help line centres for filling the application form. Candidates can visit the helpline centre along with application fee. The operators sitting at the helpline centres fills the candidate application form. Applicants will get the hall ticket on the same day of application submission. Candidates belonging from general category are required to submit the application fee of Rs. 330/- and for SC/ST candidates, the application fee will be Rs. 165/-. Application fee can be paid via TSonline/payment gateway/Net Banking/Helpline centres. Candidate should be the citizen of India. Applicant should belong to Telangana state. Minimum educational requirement for appearing the entrance test is SSC/10th class passed with at least 35% marks from the state board or any other recognized board. Qualifying examination must be passed with Mathematics as one of the subjects. Candidates who have passed 10th class from NIOS/TOSS/APOSS/CBSE/ICSE are required to pass Physics, Chemistry and Mathematics individually with minimum 35% marks. Appearing candidates may also apply. There is no limitation in the age criteria for appearing TS Polycet. Visit the official link. (link will be provided above). Enter details in the application form including personal and academic details. Check and confirm your entries. Visit the official website of exam conducting authority (link will be provided under the notification section of our article). Fill all the required entries including SSC hall ticket number, DOB, address, test city, etc. Candidates need to upload the scanned images of photograph and signature. Images can be uploaded by clicking on browse button, choose file and click on ‘upload’. The Online payment can be done through credit card/debit card/net banking. Candidates can also submit the application fee to the nearest TSonline/helpline centres. After the successful submission of application form, candidates can download their hall ticket through the official website or they can also request the hall ticket from the helpline centres.